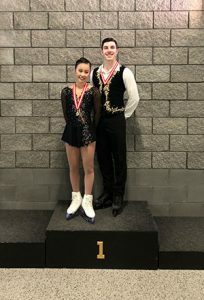 The Skate Canada’s Championships A of the Quebec section were held last weekend. This was our third senior level competition. Thierry and I were the only participants in our category during this competition, so our goal was not to win, but to perform at the height of our abilities. Indeed, our technique is very good during our training, so the aim now is to ensure that we do in competition what we do during our practices, with the same confidence and the same attack. Despite our obvious progress in skating, interpretation and some technical elements, we still have work to do, especially at the mind level! The week before the competition, we went to see our choreographer Julie Marcotte and we incorporated a lot of changes. 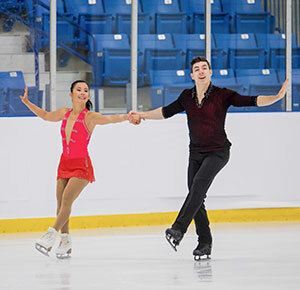 We may not have had enough time between these changes and the competition to make the transitions more fluid, but the fact that we have been skating together for a number of years has probably helped us to keep our unison similar after all. Despite very costly mistakes, we still got our best long program score in this category. What’s nice about competing in the province is that the whole family can come and watch. It is more difficult when we are in another country or elsewhere in Canada! In addition, the encouragement of the other members of our training team, who have stayed to watch us, show a very strong team spirit, and this is one of the things I love most in these competitions! Despite these difficult times, we are coming out of this experience with new goals, new areas for improvement, a senior provincial championship and a seventh consecutive year on Team Quebec!